Admissions Open at Peoples University of Medical and Health Sciences for Women's Main Campus, Nawabshah for the batch Spring 2019. PUMHS offers admissions in different fields of study for Master Programs. 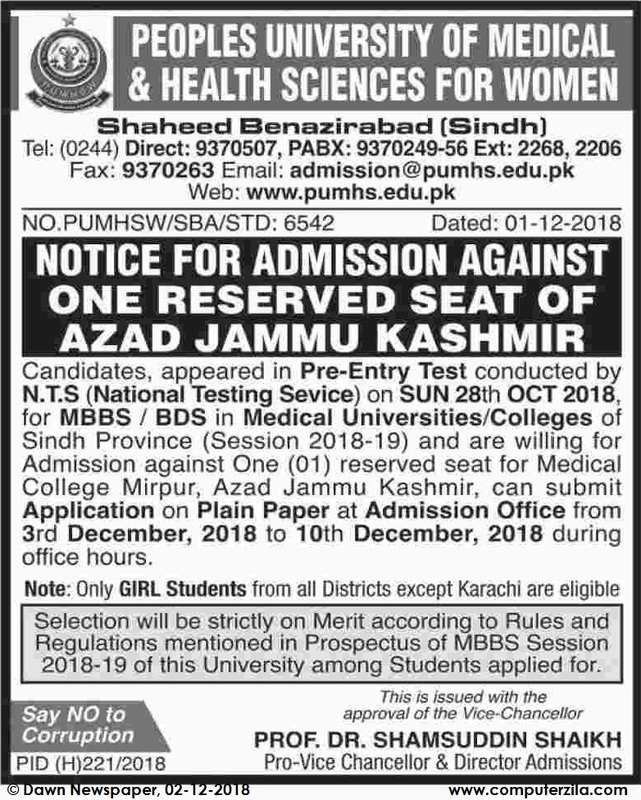 Peoples University of Medical and Health Sciences for Women (PUMHS) Offers Admissions 2019 in MBBS / BDS. University DescriptionThe Peoples University of Medical and Health Sciences for Women (PUMHSW) is a public university located in Shaheed Benazirabad District(Nawabshah), Sindh, Pakistan. It was established in 2012. the premier Medical College exclusive for girls, came into existence in April 1974 at Nawabshah with the name of Peoples Medical College. About 6000 lady doctors have been graduated from this college so far.Postgraduate training in this institute started in 2004 and since than about 600 postgraduate trainees has imparted training in various specialties. Intially this college was temporarily housed in portion of District Council High School consisting of a couple of hostels and auditorium (Latif Hall) along with the main building of Muslim Boarding House. The first batch was admitted with an approximate enrollment of attached to the college for the purpose of clinical teaching. Campus AdressPeoples University of Medical & Health Sciences for women, Nawabshah -Shaheed Benazirabad 67480, Sindh - Pakistan.